Meet Paul Ryan, Media Darling. He’s Sensible, Serious, and Totally Made-Up. Fawning portrayals of the new House speaker insist he’s the Republicans’ savior. He’s not. The beatification of right-wing Republican Paul Ryan has become an almost annual ritual among the punditocracy. This bizarre tradition began when Ryan released his first budget as chair of the House Budget Committee in 2011, and repeated itself a year later when he rereleased it. It occurred a third time when Mitt Romney—under powerful punditocracy pressure—picked Ryan as his running mate for the 2012 presidential campaign. Now we are in the midst of yet another episode in this sorry franchise, as Republicans and their apologists and propagandists beg Ryan to use his superhero powers to save them from the lunatics who have taken over their party. It’s a measure of how deeply the Republicans have dived into know-nothing, do-nothing nihilism—and, no less significantly, how deeply our most prestigious pundits remain in denial about this fundamental fact—that Ryan has been able to continue the charade, despite having been repeatedly exposed as a math-challenged Ayn Rand acolyte. By now, the narrative is all but set in stone: Paul Ryan is saving the Republican Party from its Tea Party golem. Brooks’s fellow New York Times pundits James B. Stewart and Joe Nocera also raised their pom-poms and lowered their intellectual standards to cheer Ryan on. The former misled his audience by insisting that Ryan’s plan would somehow raise taxes on the rich. The latter lamented that Democrats proved “gleeful” when they won a special congressional election that turned, in part, on the voters’ distaste for Ryan’s plan. The man was so wonderful, apparently, that the other guys should simply have forfeited the game and gone home. In fact, according to the Center on Budget and Policy Priorities, Ryan’s budget would have “likely produce[d] the largest redistribution of income from the bottom to the top in modern U.S. history and likely increase[d] poverty and inequality more than any other budget in recent times (and possibly in the nation’s history).” The Urban-Brookings Tax Policy Center calculated that people earning over $1 million a year could expect, on average, $265,000 above the $129,000 they would have gotten from Ryan’s proposed extension of George W. Bush’s tax cuts. Meanwhile, middle-class and poor Americans would likely see their incomes decline, as Medicare and other support programs would be slashed to the point of destruction. Even Ryan admitted that enactment of his Robin-Hood-in-reverse plan would lead to a significant increase in the deficit, an unavoidable fact despite the transparently dishonest assumptions on which the argument rested. These included science-fiction levels of predicted growth, together with the pie-in-the-sky promise to close unspecified tax loopholes. Those loopholes, it turns out, only seem to increase with every campaign contribution. By now, the narrative is all but set in stone. Washington’s own St. Paul is saving the Republicans from their out-of-control Tea Party golem. 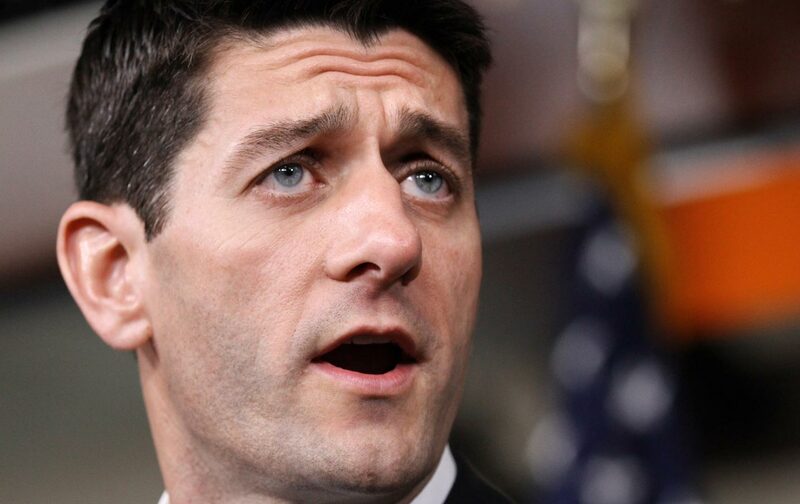 As one of many breathless Politico headlines put it, Ryan “conquered the Freedom Caucus” by forcing its members to cave in on the demands that toppled the hapless John Boehner in return for Ryan’s willingness to accept the crown of House speaker and save the party from catastrophe. Once again, however, the devilish details contradict the story line. Ryan’s deal with the Freedom Caucus crazies, according to Politico itself, rests far more on capitulation than conquest. For starters, Ryan agreed to give the Freedom Caucus more power on the influential House Republican Steering Committee. He also promised to drop immigration reform from the Republican agenda and to follow the “Hastert rule,” by which no legislation can come to the floor unless it is supported in advance by a majority of Republicans—which means guess who? If the Mets had played this well against the Dodgers and the Cubs, they’d be watching the World Series on TV. This “Ryan to the rescue” fairy tale is merely the latest manifestation of a corrupt bargain made by many members of the mainstream media. Unable to escape the intellectual straitjacket that requires them to cover the Republican Party as if its ideas are serious, they accept a false equivalence between Republican crazy-talk and normative reality. Clearly, no honest analysis can support such coverage of a party whose leading candidates—including Donald Trump, Ben Carson, Carly Fiorina, and Ted Cruz—routinely say such nutty things that they make far-right extremists like Jeb Bush and Marco Rubio sound relatively reasonable. As the respected (and centrist) political scientist Thomas Mann of the Brookings Institution recently put it, “Republicans have become more an insurgency than a major political party capable of governing.” This “reality of asymmetric polarization, which the mainstream media and most good government groups have avoided discussing,” Mann notes, has come “at great costs to the country.” Quite obviously, it should also have cost its enablers their reputations for honesty, perspicacity, and prudence. But the pontification business in America is apparently a perpetual-motion machine that can run indefinitely on ideological hot air.